nanna McGraw doesn't teach art per se, but she often includes an art component in what she does teach. 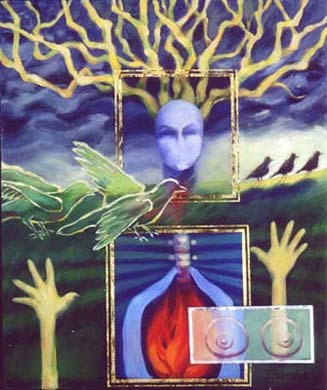 Inanna is a Reclaiming Tradition witch and priestess and teaches classes in magic and ritual. Drawing or painting sometimes helps her students remember and incorporate what they learn. 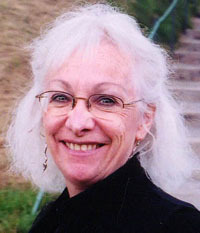 Except for a couple years out of state, Inanna has lived in Portland since 1964. Inanna McGraw prefers to have her paintings suggest rather than spell out, and describes them as mythic, dreamlike, evocative. "My style of painting is going through a major morph right now, so it's hard to put into words," she said. "Second gate," oil and metallic leaf on canvas. "But the main thing about my work, at least to me, is the color. It's what I use to express myself; the forms and images are secondary." 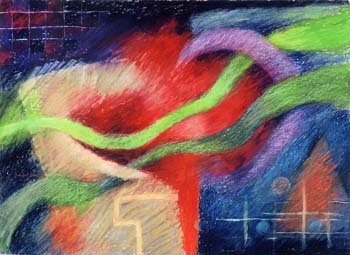 That may be one reason why after years of doing mainly figurative work, Inanna is moving toward abstraction. "However, I think that if you looked back over all my work, almost 25 years of it now," she said, "you'd always be able to recognize it as mine and see the relationships between the various bodies of work." 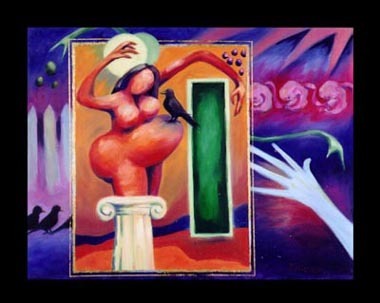 Inanna's recent series, 18 paintings in all, is loosely based on the ancient Sumerian myths of the goddess Inanna, especially her descent into the Underworld. "The goddess puts on her royal robes, crown and all the emblems of her power and descends to visit her sister, Ereshkigal, queen of the dead. At each gate, one of the emblems falls away from her until she goes through the final gate naked and bowed low," she said. "It's an initiatory myth, really. Inanna the goddess achieves spiritual enlightenment through giving up everything she thought was hers, including her own life  her sister strikes her dead. "She eventually comes back to life and returns to her own world, but everything is changed; she's gained wisdom and vision." Inanna the artist once felt that she was living out this very myth; enduring loss after loss, going down and down. When her life finally improved, she decided to honor the myth with paintings. "Darkness comes down," oil pastel and collage on clayboard. During her work on the series, Inanna realized that the goddess was primarily a spiritual seeker, which she sees as her own essential quality. Since she never liked the name her parents gave her  never felt it fit  Inanna knew this was the right moniker for her. "One of my mother's early novels was set in ancient Egypt and had a Syrian princess named Inanni," she said. "I like to think that if I'd been born a few years later, she might have named me that!" Inanna admires the work of many artists, but the one who influenced her the most was Pierre Bonnard. "Back in 1979, when I was working on my thesis, my advisor looked at what I was trying to do and suggested I study Bonnard," she said. 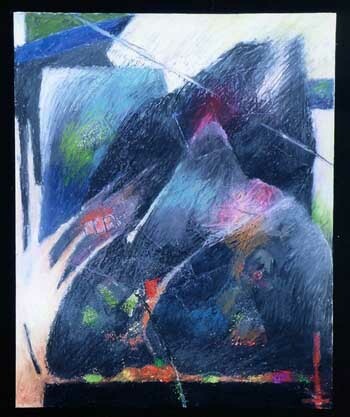 "I did and was blown away by his use of color: how the color wasn't contained within the forms; how the forms were given volume by color rather than value; how faces, forms and content were subordinated to the abstract qualities of the painting. "It was a revelation me and I've been mining that vein ever since." Although she doesn't think her work resembles his, Inanna still occasionally flips through her Bonnard books for inspiration. "Matrix," oil and metallic leaf on canvas. This month some of Inanna's work is at the Talisman Gallery on Northeast Alberta. The group show, appropriately titled "Foot Square," contains nothing larger than a 12-inch square. "It was a challenge because I almost never work that small," she said. "I did a mini-series called "The Cat Circus." It had to do with a situation my partner and I are grappling with: civilizing respective cats and trying to get them to live peacefully in the same house. "As you might expect, we humans are the ones jumping through hoops!" Inanna's newest pieces will be in a two-person show with Miriam Badyrka at Talisman Gallery Feb. 27-Mar. 21.
and now, for something completely different! '," she said. "I knew I wanted to move toward the abstract, to bring more collage into the work, to do smaller pieces, etc. After searching for several months and driving myself slightly crazy, I found a theme, evolved an approach and settled on media. 'The Love Files' series is mostly abstract with a few images floating here and there." 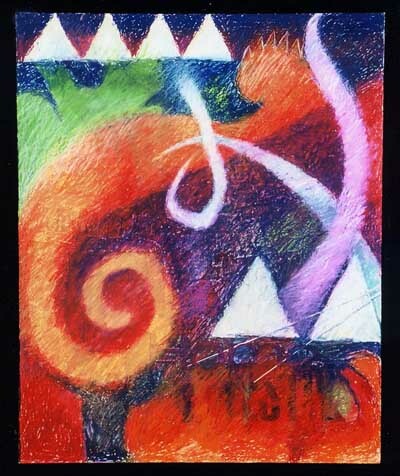 "Three Cats and Two Dragons," oil pastel and collage on clayboard. Working in collage and oil pastel on clayboard, the approach is exciting for Inanna. The medium is infinitely workable, so she's able to let the pieces evolve as they will. "It's as if they have lives of their own and show me how best to create them," she said. "The medium can be frustrating, too. I sometimes have a kind of love-hate relationship with it, but mostly, I've been having a great time." Both Inanna's parents were fiction writers by profession, but her mother had an art degree and dabbled in art throughout her life. "My dad couldn't draw at all," she said, "except for one little cartoon of a cow, always the same, which he would draw if I asked. Dad was a newspaper reporter until I was about 7, and he kept us supplied with yellow copy paper and big, soft pencils." Inanna drew a lot, though she never thought of it as "art" or realized that an artist was something a person could decide to be. "I knew about Van Gogh and Gauguin and Toulouse-Lautrec because my mother was heavily influenced by the Post-Impressionists, but I guess I thought they were singular phenomena, like unicorns," she said. "Sacred marriage," oil and metallic leaf on canvas. "My original ambition, which lasted until reality set in  when I was about 15  was to be a ballet dancer, or possibly an actress. When that dream disappeared, I floundered around for a long time, looking for something to replace it." In her late 20s, Inanna headed to the Pacific Northwest College of Art. Since then she's done etching, printmaking, monotype, papermaking, calligraphy, book arts and, until recently, earned her living as a graphic designer and copywriter. "I took a sculpture class in school," she said, "but the only thing I liked well enough to keep was a clay figure of an elephant; it still sits on my living room windowsill." "I don't care for photography, and I'm a terrible photographer. When I take snapshots I cut off people's heads!" There might have been a time in Inanna's life when she could have stopped creating art and turned to something else, but that's long past. She keeps at it because she has to. "Women of Ireland," oil pastel and collage on clayboard. "Art is the way my mind works now," she said. "It's part of the way I cope with things and live my life. I experience the world  events, people, everything  as part of the process of doing art. If I get busy with other things and can't work for a while, I get terribly cranky. "Sometimes it's hard to keep creating; it can be discouraging, frustrating, depressing. But when it's flowing, when things are working, when I'm absorbed  nothing compares. "I'm in another world, and it's the world where I feel most like myself and most at home." E-mail Inanna at inanna@teleport.com. Reach Kathy at kanderson138@comcast.net, and draw on other Sketch Pads.